Place grated cucumber in a fine sieve and allow to drain for a few hours. If you are short on time you can squeeze the water from the grated cucumber with your hands and then pat dry with a paper towel. Combine all ingredients in bowl. Cover with glad wrap and chill in refrigerator until ready to serve. 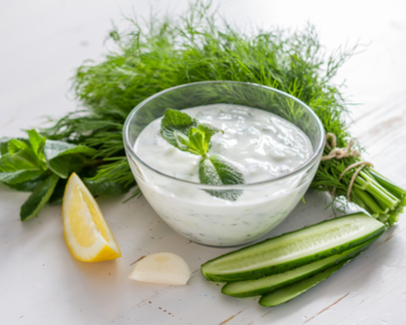 It is best to let the tzatziki sit in the fridge for at least a few hours to allow the flavours to combine.